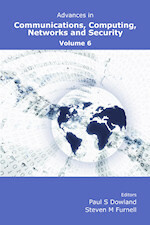 This book is the sixth in a series presenting research papers arising from MSc/MRes research projects undertaken by students of the School of Computing, Communications and Electronics at the University of Plymouth. These one year masters courses include a significant period of full-time project activity, and students are assessed on the basis of a thesis, plus an accompanying research paper. The publications in this volume are based upon projects that were undertaken during the 2007/08 academic year. A total of 35 papers are presented, covering many aspects of modern networking and communication technology. The expanded topic coverage compared to earlier volumes reflects the broadening of our range of MSc programmes. Specifically contributing programmes are: Network Systems Engineering, Information Systems Security, Web Technologies and Security, Communications Engineering and Signal Processing, Computer Applications, Computing, Robotics, and Interactive Intelligent Systems.